The season of Advent has come and gone. As January is on the horizon and people (aka me) train themselves to start writing 19s instead of 18s as the excitement of a new year dawns, I find myself reflecting on what this last month of the calendar year has meant for me. Leading up to Christmas each year, I find myself drawn into the theme of anticipation and waiting that advent stands for. As the advent wreaths begin to be lit during church, I remember the beauty of what it stands for. But normally as each new year or 26th day of December comes, I forget the beauty of the season in an instant—being some sort of shocked excited the next year when the wreath begins to be lit again. I found this year that God was giving me nudges (nudges of grace, honestly) to remember and reflect on the beauty of advent and the entire Christmas and Christian story. This year is an in-between for us fellows—some may even call it a gap year between college and ‘real life’. We are in some ways taking this year to start well slowly into ‘adult’ life. It feels like we are waiting in anticipation to see what life brings next. And the fellows' program brings to light the beauty of this in-between sort of year. I have treasured every moment. It is in some ways a tangible way of embracing the not yet of life, as Joanna says. This year will not be the end of some sort of anticipation or waiting in life. Can’t we all think of something we are ‘waiting’ for? I am thankful that God doesn’t meet us in our waiting empty-handed. Christmas and advent remind us to look past our immediate circumstances to something much bigger than ourselves. That God met us in our waiting with a baby; the Savior of the world. We see from looking at the Old Testament that God fulfilled the promise of a Savior through Jesus. It is a gift to celebrate that this holiday season. I want to remember this as the forefront of each of my days, not just once a year. And now as Christians, we are in a new advent season—we wait for Jesus to come again. But that doesn’t mean that we wait for hope to start. Hope has come, hope has begun. He who promised is faithful. I once compared my mind to a hamster in a wheel. My hamster even got his own name, that’s how easy it is to envision the scattered state of my attention span. My life has always had two speeds: fast and faster. I’ve challenged myself to write down my stream of consciousness and my pen quite literally couldn’t produce enough ink to keep up with my mind. The past 4 months of starting the Fellows my little hamster wheel feels like it has grown larger than the ferris wheel at the fair. Every week we are taught new things in class, everyday I learn new things about life, and every minute I unfold a piece of my own story. My little hamster legs are just trying to keep up with every carrot taunting my onward (honestly a very funny metaphor to picture, I hope you are imagining alongside of me). The Raleigh Fellows Programs subtitle in italics should state: A Season of Life Where You Gain Enough Information to Write a Textbook. The insider edition of said textbook would be pages of facts, nuggets of Truth, and quotes from ordinary people doing really extraordinary things. Sometimes the pages of information feel so heavy and daunting that I don’t know where to begin, so I just place it on the shelf and hope it goes along with the rest of the decorations. One of my most recent chapters of my Italicized Informational Textbook would be titled “Leaning In”. It’s something I am not familiar with reading or doing. It takes me having to sift through as I process the words being thrown at me. It means creating margin of stillness in a schedule of chaos to think and hold and pray. Leaning in takes curiosity to search for answers and courage to realize that the A’s to your Q’s might not be displayed in a pretty way that you hoped them to be. Leaning in means looking lies straight in the face and saying no more. Leaning in is an invitation to walk and weep and laugh with Jesus. Beyond all of the information, I can’t get over the people. We meet and hug and shake hands with humans whose stories breathe new life and redemption. I wish I could tape a GoPro on my forehead and rewatch every moment and listen to every conversation that unfolds whether it be in a seminar or at a coffee shop. I’ve seen a grown man cry as he explained “why would I hide my tears if I don’t try and cover up my laughter”. I have heard the Ambassador of Human Trafficking tell stories about his job and then sit across me at a cafeteria table and tell me about his wife. I have been encouraged to fight for equality by individuals who have worked for anti-racism rallies. I have learned about prayer through priests and family systems through teachers. I have seen life lived and healthy marriage displayed through family members in Raleigh who have invited us into their normal dwelling. The lists of fascinating people only fuel my fire of wanting to be Oprah in the hopes of getting paid to hear their stories (honestly, at this point hold the commission I’ll listen for free). My desire for 2019 is to continue to lean with it rock with it. Let us rise to the questions of our time. Let us speak to the injustices in our world. Let us move the mountains of fear and intimidation. Let us shout down the walls that separate and divide. Let us fill the earth with the fragrance of Love. Let us be women who Love. Let us listen for those who have been silenced. Let us honour those who have been devalued. Let us say, Enough! with abuse, abandonment, diminishing and hiding. Let us not rest until every person is free and equal. Let us be women who are savvy, smart and wise. Let us be women who shine with the light of God in us. Let us be women who take courage and sing the song in our hearts. Let us be women who say, Yes to the beautiful, unique purpose seeded in our souls. Let us be women who call out the song in another’s heart. Let us be women who teach our children to do the same. Let us be women who Love, in spite of fear. Let us be women who Love, in spite of our stories. Let us be women who Love loudly, beautifully, Divinely. I think this is a problem that many others who are my age face their first year after college. I spent four years studying theory and expected to have the perfect job handed to me instantly. I really woke up one day and started to take a step back and think on why I felt so entitled and how I could change it. This whole experience reminded me of a story from high school. I grew up playing basketball and I was pretty good in elementary school. I grew earlier on than all my friends so I was 5’7 in the 6th grade. Life was the best, I didn’t have to try that hard, rebounds were essentially handed to me. I thought that this was going to be what forever would be like. I was under the impression that I would just be a good basketball player because my Dad was good. So I never really worked that hard at it. So I woke up one day and I was still 5’7, but everyone I played against was a lot taller than that. Junior year of high school, I went from starting to coming off the bench, to no playing time at all. It was never my fault though; it was always the coach. He was out to get me. I mean there was no way it had anything to do the fact that I was a liability on defense. It definitely had nothing to do with the fact I spent all offseason playing video games and munching on Doritos. I remember feeling entitled. I believed that I deserved to be the best without any work. Then my dad came downstairs one night while I was playing 2K13 on my Xbox. I had complained to him all season and I think he was tired of hearing it. He said he didn’t want to come to my games to watch me ride the bench, but if I wanted to work hard he would help me get better. Then before he walked back upstairs he turned to me and said, “your attitude is going to affect your altitude in this.” It was super cheesy but it was awesome. So we worked out together all spring and most of the summertime. We would go to the park and do sprints together. I watched youtube videos on how to improve my skills and even tried to become faster. When the next season came, I had a starting position again and it was awesome. My basketball team was still really bad but it was my favorite season. I don’t really remember what our record was. All I remember is that my dad cared enough to work with me through the process. Jesus worked hard, and he served others. So I’m checking my attitude at the door of this YMCA and focusing on the blessings God is showing me at work. It is a blessing that God does not care where I work but how I work. It is a blessing that I am not as important as I think I am. It is a blessing that I get to work with wonderful people and help make a difference in kids lives. And it is a blessing that the Lord is working with me each and every day in the process. Maybe one day I will be a starter, but right now I am going to enjoy the process. May the day never burden you. I’m not entirely sure where November went, but all of a sudden it’s December 5th and November is over and it’s that time to reflect on the past month of Fellows yet again. This month has most definitely been the busiest month of Fellows thus far, with a regional Fellows retreat the first weekend, being in a friend’s wedding the second, family birthday celebrations the third, Thanksgiving the fourth, and my first PA school interview (conveniently in Kentucky hah hah) the fifth. I feel like I haven’t gotten a chance to take a breath, and that has left me feeling drained and disconnected from the program and the people in it in a lot of ways. I forget when or where we talked about this, but at some point this past month we talked about busy-ness in a way that made me incredibly uncomfortable because it was convicting for me. Basically, we talked about how in the past the idol of our culture has been leisure, as in you know you had ‘made it’ when you no longer had to work, and could spend all of your time doing leisure activities. But now, the idol of our culture has shifted from leisure to busy-ness, and a constant competition between one another to see who is busier, because in that busy-ness we find our value and worth as a productive human being. And is that not often how I find my worth as well? That if I do enough things, fill my time with enough activities, or people, or work, that somehow after all of that I will find that what I’m doing is finally sufficient? But it never is, so I keep adding. Because that’s what we do, what I do, when our idol is busy-ness. The whole concept of busy-ness is tricky, because there is a certain degree of that which is good, for the Lord designed us to work, and to work hard. But how much are we supposed to work? How much is too much? When is the last time we also listened to the part of His design for us that involved a full day of rest? There are so many questions and so few concrete answers, and that’s so hard. Because I want nothing more than to ‘fix’ myself and make myself do the right thing, and yet I can’t seem to. There are so many things that I’m learning in Fellows that are so convicting; I’m being forced to push the boundaries of how I think and why I think that way, and where to give grace and where to give up legalism. There’s so much that I want to absorb and take in to myself, and yet I just can’t seem to do it. And that leads to feeling like I’m not taking advantage of the resources I’m being given, which leads to guilt and sometimes to shame, the latter of which is never good. So how do we stop the cycle? Where does it end? Something cool that we talked about in class last Monday was the difference between guilt and shame. And while talking about them, I realized I had never really articulated the difference between them, but I knew there was one. That day, I was finally able to articulate out loud what they each are, and I realized how vital it is to for me, and for everyone, to understand that difference. Guilt, which is inherently good, is our first sign of a sin committed. That recognition leads to conviction, which leads to the foot of the cross, where Jesus is patiently waiting for us to lay down our sins so He can forgive and gently wash us clean, clearing us of sin and guilt. Shame, on the other hand, does the opposite. Shame tells us that we are what is bad, not sin. Shame takes us away from the cross, and towards our own self. And this is where things get dicey, because shame tells us the opposite of what the gospel does, which is that we are never worthy, and always unapproachable and unforgiveable. Shame takes the truth of who Jesus says we are and twists it into a form beyond recognition, disallowing us from seeking Him and coercing us into seeking some ugly form of self-correction instead. Shame is what we have to FIGHT, because Jesus doesn’t want us to feel ashamed. He wants us to come to Him rather than to ourselves. These are only a few things that I’ve learned this month, but I hope they give you a small peek into what Fellows is having me reflect upon and dig into. What I’m learning makes me uncomfortable sometimes, and it digs at things that I don’t always want to be sought after, but I’m learning and growing and that’s the point of this program. To push things that are difficult, for the sake of sanctification and learning to sit with Jesus more every day. It’s crazy to me that the Creator of the universe actually enjoys just sitting and being with us, but it’s the truth that I will always hold on to in the midst of so many other moving pieces. Chapter 3: The Sentiment Floods Back In. One of the main attributes that my friends back home know me for is when I get so overwhelmed in a moment of joy that I just scream I LOVE MY PEOPLE. 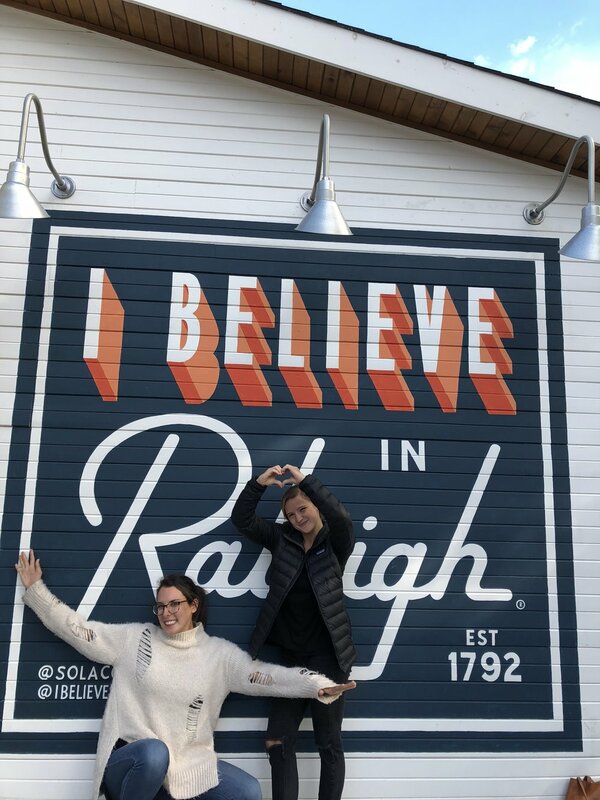 And as my last two blog posts have recognized and reflected, I have been on a slow journey to sentiment with these new people here in Raleigh. As we live life together, as we learn about what it means to love God and love neighbor, as we battle with asking our families hard questions for an assignment that requires deep reflection on self and family, as we giggle about nothing when we’re supposed to be paying attention and being intentional, as we find ourselves at karaoke bars that are set up as mini living rooms, as we create relationships with teachers and mentors and just down right wise people who open their homes to us and make room for all 11 of us in their lives, as we are taught to sit with the Lord and give Him time and ourselves grace when we don’t find that time— all of these things are all of a sudden making me stop in mid-jaunt and scream I LOVE THESE PEOPLE!!! It’s all cultivating this true sense of community that in my head is actually exemplifying what the heavenly Table is going to be like. This place where we are walking and talking and growing and giggling and always yelling I LOVE THESE PEOPLE!!! So that’s been cool. I also am just incredibly thankful for every family in this community. Because another prong of this blog post is about homes. Each of us live in someone’s home. That’s 11 families that were like, “Yea, I’ll give up space in my house to a stranger and let them roam and eat my food and share my couch and possibly probably mess up my routine and leave dishes in my sink sometimes and leave my bathrooms dirtier than they were before and invite other kids to my house. That sounds fun.” And then on top of that is all the other families who welcome us into their homes for class, for dinner, for talks on the porch, for random intervals between responsibilities, for opening their REFRIGERATORS and their PANTRIES, for us nomads who just float from house to house and receive actual nourishment. It’s hard to not have your own common place, your own house, your own couch, your own fridge. It’s hard being this kind of nomad. Because yes we all have homes but recently I have felt the effects of not having one space to go to and feel completely at home and comfortable. But when I think about it, all of these families are not feeling that completely either. Because their house which used to be completely theirs is now being shared. So my point is, our homes are meant for each other. They are meant for sharing. They are meant for cultivating these heavenly environments of community and sentiment. And I am so thankful for all of the families who are seeking that by being a part of the Fellows community. As Jason said in a prayer recently, we are an adult cohort that reflects life and eternity in a world of darkness. We are nomads in this world because it is not our final home. So there is always going to be a sense of discomfort and crossed boundaries. But praise God from whom all blessings flow for the homes that we are able to create and the people that fill them and the promise that the memories made by these homes and these people are relevant today and will be even more relevant and beautiful in eternity. Well folks, we have a lot to cover since our last interaction. I am now three months into the Raleigh Fellows program and I’m just now writing my second monthly blog post. In case you were wondering, 3 ≠ 2. I did not do my blog post from last month and so I will do my best this time to fill y’all in on everything from October and November. Maybe you are asking yourself, “hmm self, I wonder why Philip didn’t write his second blog post?” I wish I had a good answer to give you. The truth is though, I don’t know why I didn’t write it. I didn’t forget… how could I with Alex and his marvelous Groupme reminders that blogs are due? I think I just didn’t want to. I didn’t want to sit down and reflect. I am realizing this is a problem I have. Reflecting. I feel as if I don’t know how to do it. I’ve grown apathetic to it because it is easy to simply enjoy experiences and not look back on them. It is easy to go through life without reflecting. There have been some amazing things that have happened in the past two months. 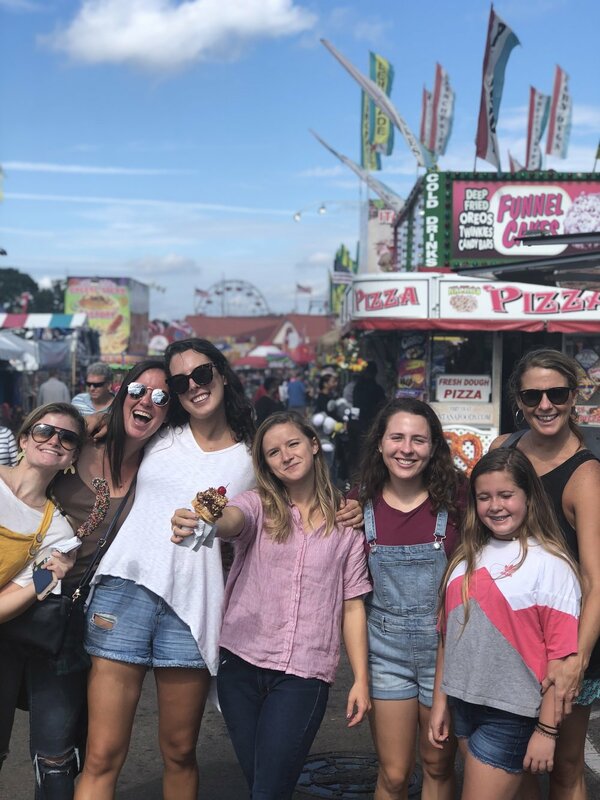 I went to the NC State Fair with all the Fellows plus more friends and ate way too much fried food. We have heard some incredible speakers come and talk to us about truly important things. Dan Nobles spoke about contemplative prayer; Pastor Jay Traylor explained the “why’s” behind Anglican liturgy; Sam Bass (that’s my host dad!!) and Geoff Hall showed us all about managing our finances and what the scriptures say about that. We went to a weekend camp with the Apostle’s youth group. It was so much fun to hang out with my tenth grade guys and see how God is working in those relationships. We went to a weekend retreat for all the eastern Fellows programs where we got to hear the US Ambassador-At-Large for Trafficking in Persons talk about what it means to act justly, love mercy, and walk humbly (Micah 6:8). I wrote and presented my own eulogy in which I made everyone present toast my memory with a Nacho Cheese Dorito eaten via fork. I went to Southport, NC for Thanksgiving with my family because my parents will be moving there in the spring! Additionally I was able to visit one of my best friends from childhood along with one of my best friends from college and his wife in Boston, MA where I am currently sitting in Terminal A Gate A11 of Boston-Logan Airport writing this already late blog post (it was due November 30). I am really having the time of my life. I love this program. I love the people. I love my job. I love Raleigh. Despite this, I keep coming back to the reality that even though life feels mostly amazing right now, I know I am missing a huge part of it. My time with the Lord has been mediocre at best. I have been struggling to sit with Him and talk with Him. He feels distant to me at times and I think it stems from me having a hard time reflecting. Having a hard time looking back and seeing how God is shaping my life through all of these amazing events that have been happening. My mentor, Bob, has been such a light in this. Whenever I get together with him, he is so patient with me and so good at having me look back and sift through everything around me. I know the other fellows are always there to love me as well because they are a group who loves and cares so deeply and well. Amongst all the madness and laughter of the first three months, I think God has been revealing to me this struggle I have with reflecting. So I am excited to see how he is going to work in me in regards to that. Unfortunately it’ll probably take some reflecting to figure that out. It is easy to go through life without looking back and reflecting, but is it worth it? I have lacked a lot of motivation to do really anything this month. I have struggled to be present with my friends, present in classes, present in work, and honestly present in my relationship with Christ. This month has been a month of struggling to fight for joy. My usual motivators, the things that really get me going, have been dragging me down. I have felt alone in a room full of friends, and have let the negativity of the world and thoughts that come along with that creep into my daily actions and words. Come and see, three words that are used fairly often in the Bible, inviting people into the truth of Christ. Even though currently I sit in the jurisdiction of “Can anything good come out of Nazareth?” I am hoping as I walk closer to Christ he will call out to me, “Come and see what good has already come out of the Nazareth and I will show you greater joy, love, and peace than you could ever imagine.” I know there are seasons of this, where it just seems like nothing is joyful or happy, but I know that this is a season. I know that the Lord is good and he calls us like he called Nathanael. So as I continue to walk to where Christ is, absorbing and cherishing what is around me, I am intently listening for this call of come and see the good that surrounds you Daylon. P.S. If you were wondering if the fellows is Raleigh exclusive, it isn’t. BUT Raleigh be the city. I'm a Carolina Basketball Fan Now! Another month has come and gone here in Raleigh. Happy November 30th! It is hard for me to believe that one-third of our program is done. I am in a season where I want time to slow down. I have found myself hoping for longer mornings, more time in the adventurous, still and everything in between with other fellows and in sweet conversation with the people I work with. Going to Richmond (home sweet home) over Thanksgiving, I was longing for more hours with family and familiar friends and coming back to Raleigh I couldn’t wait for more time to spend with my host family. I am yearning for more time in the simple moments of everyday. In reflecting on this, I realize how special this is. It is not all the time that I am wanting to stay in so many moments for as long as I can. The Lord is revealing me so many sweet blessings during this time of life in the fellows program. This is not to say that every day is easy, but God is showing me small snapshots of beauty that I want to cling to. Beautiful moments like running through the rain and enjoying my first ever Carolina basketball game with Emily and her parents (I am now a certified fan [see title of post] TAR!!) and the authentic friend that she is. Working with Rachel and knowing she will pop into my office almost every Tuesday - Thursday promptly at 9AM to chat; a beautiful consistency. Having Philip as my roundtable cooking partner and getting to see more of his incredibly patient and kind soul. Always knowing Daylon will be my hype man in an instant, but also someone to be real with. Getting time with Sarah who can get to the bottom of your heart in a five-minute conversation and how the Lord is beautifully using her in our fellows group. Looking across the room at Jun during a funny moment and knowing that he will be giggling right along with you. Laura feeling like a person of refuge and home, whether that be because we actually frequent her host home’s porch a lot (thank you sweet Dotson family, we love you) or because that is just who the Lord beautifully made her to be. Sitting next to Josiah at roundtable dinner and hearing his hilarious side comments but also intentional questions about how people are. Giggling with Alex about memes and moments and knowing he is always down to bool (is that how you spell that?) (it means “hang” if anyone did not know). Being around the joyful, peaceful presence that is Amy and knowing that I can always count on her for anything—whether it be meaningful conversation at LBC or dance breaks with our 6th grade girls in youth group. I am thankful for all these beautiful moments and more, especially with the 10 people I get to walk alongside this year with. I am thankful to be given moments that I am always longing for more of (can’t time slow down?). But I know this feeling of longing for more time in sweet moments won’t go away. We may always have this sense on Earth. God gives us little glimpses of glory each day. This glory that will one day be shown in full when we reach his kingdom. I am grateful for the promise of that kingdom and that it is beginning here on Earth with little peeks into it each day. My friend Erin once told me that we should write down the things that we love. So began “The List of 100 Happies”. This list became a compilation of places, moments, things and people that make your heart do a little dance and your smile grow a little bigger. Every year (honestly everyday) I think of a revision. I knock down number 76 and add emphasis to number 20 and I look back in adoration at number 4. This list doesn’t have a particular order and there are no rights or wrongs. They are just words to match feelings and pen on paper to ensure that I never forget the seasons life and little things to be thankful for. I moved to Raleigh and naturally I started a new list. So in the spirit of Thanksgiving and all the holiday cheer, feast your eyes on the happies that have slowly but surely made this new pin on the GPS feel like home. I’m thankful for the spaces that feel familiar. For LBC on a Sunday night under twinkly lights and a table full of strangers that have become community. For the Crutchfields open-door policy that ensures a free La Croix and a cozy fire to sit around. For Sola and their addictive oat milk lattes that have convinced me I can never drink lactose again. For Church of the Apostles warm greeting on a Sunday morning and generations of people that feel like family. For the Jordan’s kitchen that has facilitated conversation and without fail provides mini cinnamon rolls ready to be eaten. For the Dotsons front porch swing that I have consistently occupied even when Laura isn’t on the premises. For Mary Vandal Youngs living room couch and the spiritual formation that makes time feel slow and good. For the Kranhert’s home that feels like my second place of residence, praise God for that trundle bed and Amy Gross. For Emily Tripps backyard and the laughter and side conversations that take place while pushing kids on a swing set. For Molly Crutchfields room that I get to sneak away to on a Thursday and hear all the middle school tea. For the Byrons backyard and the inevitable croquet games played there. For Sallie DuBose and Erin Naziris’ homes that blend my old world into my new. For the Boultons basement where movie nights are guaranteed to be better than going to a theatre. I’m thankful for the small and ridiculous moments. For the sheer volume of our Fellows group. For the way we all think it’s socially appropriate to burst into song. For the pranks. For interactions with middle schoolers because we all remember how weird that season of life was. For the “talent shows” that include hand dancing in white gloves under a blacklight. For the unpredicted moments when we can’t hold in a giggle. For the Triller music videos. For every word that comes from the mouth of Emilee Grissom. For Bethany Dosters infectious laughter. For the times that Laura Merten starts krumping to worship music in church. For the dance battles and rap creations. For every single time Lauren Brawley lights up to a song and turns on her performance persona. For when people do something goofy or come alive. For the way that people allow each other to live in full freedom to be themselves. For Dance Dance Revolution at Boxcar. For the stories that we belly laugh over. Ashley Crutchfield and her wild personality that screams life to the full. The woman loves Jesus in bold ways and can dance like there’s no tomorrow. Sam Crutchfield and his wisdom. When Sam speaks we all lean in a little closer to hear what he will say. Rachel Ricks and the way she lights up and speaks about something she is passionate about. And her pipes, shawty can sing. Sarah Macris and her ability to ask Qs that make you uncover things about yourself. Philip Greco and his boldness to eat Doritos with a fork because he doesn’t what to get “cheese dust” on his fingers. Amy Gross and her “YES” attitude. I mean the girl will show up for me and join me in shenanigans at any hour of any day. Jun Soo Kim and his ability to tell a good story and have everyone else lean in, elbows on the table and all. Daylon Shaw and his DTB (Down to Bool) mentality. Remember that time we put on wigs and went rollerblading just because we could? Yeah, me too. Laura Merten and her thoughtfulness. Sister will get you a cute card and a small gift just because she wants to remind you that you’re worth it. Josiah Lindquist (JoJo) and his consistency and willingness to spend time with people. Lauren Brawley and the way she RADIATES (especially when Usher comes on Spotify que). If you want a mixture of energy and entertainment with a side of authenticity hit up LB’s line. Alex Gilleland’s quirky mannerisms that allow everyone to take off their masks and be goofy (if anyone needs a hand-dancing routine to Firework by Katy Perry, he’s got you). All the praise hands that the Master of Ceremonies was at work in knitting together this group and continues to be faithful as we lean into life together. You heard it here first, the sneak peak of my happies. Txt it for the full list. I don't really love being in the same place for long periods of time. I love being on the move and having something to look forward to. I struggle often with the practice of being still in God’s presence. I love it when I do it but busyness seems to be getting in the way of my time lately. These past couple months as a Fellow have been some of the busiest months of my life. We spend so much time doing things for God that it is hard to find time to actually spend time with God. I usually react to this by questioning where God really is and getting angry with him. There is this kid that loves to not listen to what is asked of him and go with the flow. It is awesome to watch. One afternoon when we were outside he decided to act like he couldn’t hear me when I asked him to come sit down for a game. I called his name and warned him 3 times and he stuck out his tongue, continuing to do his own thing. Obviously this is not okay so I told him he was gonna have to sit in time out for 10 minutes. This was definitely not part of his plans for the afternoon. He wanted to show me this so he pushed me as hard as he could and told me I was the meanest person in the world. Another counselor came over and talked him down then he came over to me to apologize. I think I kind of act the same way with God. I want to run around and do my own thing. I want freedom. Then when I come to the Lord and he doesn’t say what I want I get angry. He doesn’t put us in time out though. He loves us where we are and says he is here and always will be an that we can be present with him in the here and now. I realized that instead of enjoying this truth, I often look ahead to what the next big thing is. I look forward to things. I look forward to what job I will get after fellows, where I will live, how much money I can save, when I will get married, and so on. None of these things are bad but if I am not letting them happen in God’s timing, I am wasting what he is giving me right now. So I’ll try and look towards where God is right now, and stop pretending I cannot hear him; because he is here and it is time to come sit. I’ll never forget when Richie Rojas texted me asking for my “fun facts” for fellows. I was elbows deep, head spinning, about what I could say that would make me sound unique from this sea of seemingly similar people - all college graduates seeking discernment in vocation and in this community. I wanted to differentiate myself with something other than “hiking” or “coffee shops,” manipulating and overanalyzing what response would most make me stand out. I’ve been conditioned to speak like a broken record on what MY strengths are, what I (and only I) can bring to the table, and heck, what enneagram number I identify with. I think we all strive to be - or atleast to present ourselves as - irreplaceable. Our culture and our internal narratives tell this that irreplaceability that this is the peak of success and height of security. To work our way to the top at any cost, even if it means exploiting others in order to keep our irreplaceable knowledge and power. The Fellows recently got to hear from Josh Hancock, Cafe Manager at A Place at the Table, a nonprofit in Raleigh providing community and healthy food for all regardless of means, who spoke to the fear we all have that if we teach someone everything we know, they will replace us, and not need us anymore. In our pride, we hold power over others. We like to be needed. I am learning that this sense of irreplaceability is hurtful - breeding a sense of pride within ourselves, damaging growth in community, and destroying human flourishing. Our own strength and power will always fail. Fellows recently read Joshua 24 in Old Testament Class, reminding us of the strength and power coming from the presence of God. In our world, we are ritualized to blindness, overstimulated to to the point that we fail to see reality clearly. In the Old Testament, the Israelites faced this competing reality with Baal, who presented his own narrative that was mutually exclusive and territorial. Like the Israelites, we also have counter narratives. In class, we pointed to success and busyness as temptations we feel acutely today. We project busyness because it gives us worth, value and productivity. Yet busyness, drives us into despair, loneliness, isolation. Our pursuit of irreplaceability - to stand out - can lead us to ultimately stand in isolation. We aren’t irreplaceable, and if we are honest, we don’t want to be. We are simply a mist, a vapor, and our time is not guaranteed. Being irreplaceable is a huge burden to bare, a constant source of worry and stress. If we are irreplaceable, failure isn’t an option, and we wouldn’t dare to admit we are overworked, overwhelmed, or ever ask for help. The weight on our shoulders will take us one of two ways- either crush us, or inflate our ego to create a suffocating, competitive ladder within our community. Irreplaceability can’t outlive itself. As fellows, we recently wrote eulogies for Mary Vandel Young’s spiritual formations class, the concept being to “begin with the end in mind.” But, if we live with a mindset that we are the only fit for our role in our vocations, communities, or ministries, then those very eulogies truly are the culmination of our lives. Upon our death, that moment will, at best, proclaim truth ever about us, and at worst, depict an inaccurate picture of what we did or who we were. In order to truly leave a legacy, we need to learn to replace ourselves, to cultivate a movement beyond this mist of a lifetime we have. Irreplaceability takes no care to the enduring quality of the places we care most about, because it dies, relocates, or moves on with us. As much as I want to believe the opposite- I am not the only girl for the job. I am not the only fellow who could sleep in my upstairs bedroom at the Dotson’s house, I am not the “best fit” to tutor my friend Jay at Neighbor to Neighbor or lead eighth grade girls small group. Nothing stands out about the work I contribute during the week in class or at my internship. But, I am passionate about empowering these people and giving them dignity so that they may flourish with life and vitality. And, most of all, to make room for someone to come after me. My hope for this year, and for this community, is that we are paving a way for a legacy filled with grace, peace, and love to go behind us. If we believe we are the only fit for the job- we will be. But in a few months, the year will end, and so will our influence here. What this community needs is not more of me, or another person just like me to come after, but, for me to pave the way today for flourishing long beyond my time here. To care deeply these people and this place beyond the nine-month timeline I’ve been given in this space. Who will I equip and empower in this season? Who will I be proud to take my place when Fellows Graduation rolls around? What a beautiful thing to strive for - to replace ourselves. This past month (month and a half haha whoops) I have been wrestling with this idea of how short this life is. Thank you Mary Young for reminding me of this fact as we were assigned to write our own eulogy for her class. Despite this assignment making me sad and slightly anxious, it made me realize a couple of things. The first is that, my internal life has just felt like an indie coming of age movie similar to Ladybird or Perks of Being A Wallflower, 10/10 would highly recommend. This feeling has spurred me to ask myself what does it look like to an adult? The next thing that I have thought about is what do I want my life to look like at the very end of my life. Will I have accomplished my dreams and hopes that I wrote in my eulogy? Every time I try to reflect and come up with a solution or some kind of 10 year plan, my thoughts end up becoming incredibly long drawn and convoluted to the point where I end up becoming more anxious than when I first began reflecting. But then, I got to be reminded of a simple yet profound truth a couple weeks ago. We went through what it looks like to act justly, love mercy, and walk humbly with the LORD during the Micah 6:8 retreat. As we broke up into pieces, the speaker dove into what it looks like to walk humbly. In the 45 minutes, in which he shared amazing stories of redemption and beautiful reminders of who Jesus is to us, the one statement that I kept coming back to was this idea that our lives are simply not about us. We are but a vapor. We are potsherds among potsherds which fun fact are just broken useless shards of pottery. The Bible even says that we are surely just grass lol. What’s wild is that the guy who was saying this was the Ambassador-At-Large of Monitoring and Combatting Human Trafficking, and he was saying this about himself to us. I say all this because it helped me put words to a lot of my thoughts in regards to what I want my life to look like. What if I leaned into this truth of my life not being about me and applied it to my everyday life and decisions? The pressure of me finding the perfect job would be relieved as I will learn to trust that the job I choose won’t be about advancing myself but rather about something much bigger. The difficulties in loving certain people will be hopefully made a little easier as I am reminded that loving people is supposed to be strenuous and hard at times as we give ourselves away. When conflicts arise, I’ll be able to actually listen to the hurt behind the argument rather than coming up with a logical rebuttal. This truth helps our pride to be in a constant check and in turn, giving more room for compassion to grow in our lives. What if looking like an adult is to be constantly living in this truth? Life is not about me and that’s hard to swallow at times, but the reality is, we were designed to give ourselves away as Jesus did when He was on Earth. The Westminster Shorter Catechism says that the chief end of man is to glorify God and enjoy Him forever. That’s a pretty stark difference to what a lot of people want to say for their life purpose. Rather than asking what I want my legacy to be when I die, I should be asking what will the LORD do and what will His legacy be in my short lifetime. Hey y’all! It’s mid-November, and I am still Google-mapping my way everywhere. One of the only drives that I can confidently make is the 5 minute one between my house and church. But, on a positive note, the traffic is making me much less mad than it used to - I’ve just been accepting being 5 minutes late rather than raging against the red lights and dumb drivers who change my ETAs. Sanctification? More seriously, I really am loving being in Raleigh. The first month was really hard, and I did feel like I was living in a haze of sadness borne out of the grief of leaving people and place and memories when I moved here. The hovering darkness, however, has been lifting bit by bit and radiant joy has been illuminating the goodness here. I’ve had such sweet time with my Fellow friends, with my mentor, with my host family, with Ashley, and with so many others. The Lord is here with me and He has been my Comforter and my Safe One. He is at work here in Raleigh. Some sweet tidbits from my time here: my host mom makes my coffee every morning. My host dog makes me more excited to go on runs, because she grabs the leash in her mouth and runs with wild abandon, reminding me of “that joy in existence without which the universe would fall apart and collapse.” I ADORE my 7th grade youth group girls that I lead - they are thoughtful and authentic and full of questions. I’m feeling more certain about wanting to go to medical school, and this has been influenced by my work placement and by having to write my own eulogy and meditate on the end of my life for our Spiritual Formations class (heavy stuff yep). Feel free to ask me more about it if you’re curious! Talking has never been a problem of mine. I have always loved speaking with others and being around them. So finding the words to say has never been too hard for me either. Since being in Raleigh, I have found myself sitting back more and listening—at a loss of words sometimes. Especially in settings like class and Roundtable because listening and absorbing has been so much more helpful to me than speaking at times. As fellows, we digest so much information. I often need to sit in stillness and silence to take it all in. (Now, sitting in silence and stillness has been something difficult for me recently, so maybe I will write my next blog post on what I’m learning about that—stay tuned for next month.) Writing my eulogy for Mary Young’s class was about the hardest thing for me to do. I just couldn’t put my words together. All of this to say, finding the words to say for this blog post has also been on my mind. So, I decided I will share a couple of photos from October. A picture is worth a thousand words, right? Raleigh, you’re still great. I love these people and this place a lot. It’s not all easy, but I know I am in the right place. November, I’m ready for you. Maybe you’ll bring me more words to say. In complete honesty, I normally don’t struggle for words for when I write, but articulating what I am learning in Fellows is presenting itself as much more of a challenge than I thought it would be. I think a lot of that comes from learning so much that it is difficult to properly process everything, but an even bigger part is probably my refusal to take the time to process those things. When it gets down to it, I think the biggest thing that I’ve learned about myself in the past 2 months is that as much as I love deep and intentional conversations, I also avoid processing my own junk as much as I can. I prefer to fill my day with so many things that I don’t have to process anything, and instead talk around it or about it rather than actually IT and how I’m feeling about it. I am inherently an external processer, which is awesome except when I allow people to replace my need for Jesus. And I’m pretty sure I’ve been doing that a lot. In Fellows, we talk about Jesus a ton. Which is really great. But the thing is, my brain often associates talking about Jesus as talking TO Jesus, which are obviously not the same thing. So, what happens is I spend no quality time with the Lord because I feel like I am through classes and conversations and blah blah blah, whatever my brain uses as an excuse for me to not be still. But what would it look like for me to be actually still? What would it take for me STOP, to rest in the Lord, and genuinely give Him my worries and my strife? Why can’t I seem to let go of the excuses I use to not be alone and with Him? Fellows is pushing me to ask questions like that of myself, and to actually spend time answering them rather than avoiding them like I normally do. Fellows has taught me a frik ton about myself already, and basically I am just inherently a selfish and pride filled human being, who wants everything for herself and nothing for anyone else. BUT (and it’s a big but) I am also a daughter of the Creator, our Father, who claims me and makes me whole, and whose Spirit resides within me to guide me towards a path away from destruction and towards life. And in the end, it is He who defines me rather than my sin. I’m not sure if that made any sense at all, but essentially I am learning way more than I think I can even process right now, but I’m loving it even though there are a lot of challenges. To conclude, here is a poem I wrote during our Christian Spiritual Formation class that pretty accurately reflects how I have felt. And yet I refuse to see what’s in front of me. Before I even stop and realize I’m the one who’s been on the run. From the only one who truly knows what’s inside. Threatening to extinguish the fire You started; burning coal. Promising that what You have done You will never undo. Promising that from us You will never hide. Far too often my soul doesn’t truly believe. Push my heart to release everything into Your hands. Push me, Lord Jesus, for through that my love for You can only grow. Push me, Father, so I may have the strength to battle our greatest foe. Open my stubborn eyes to Your ways that I cannot yet see. So, I've been doing it wrong all this time? This stuck has stuck with me. I have been on this journey called life for a little over 23 years now and I have been living in the first option without haste, “The courage of exploring.” I have explored all across the nation from California to New York, and many places in between. I have lived the life of what some of my friends have called nomadic; living in 3 states in a four-month period, going to 4 different colleges, and making room and space for here and there friendships. I encapsulated what it meant to keep people at arm’s reach only calling on people enough that when I needed something that they would be there (let me pause here and say thank you for all the patient people out there who lived in this territory of my life and stuck around. Y’all are rock stars). My life was full of the unfolding set of possibilities and opportunities. Different camps, internships, colleges, etc. I refused to stick around places that could have been a room worth sticking around for. My life, my walk with Christ, my thought process was just, “change this, change that, do this, do that. Don’t get complacent being where you are. Go do something new, go try new food.” This list goes on and on. I missed out on numerous relationships that could have been worthwhile and threw away opportunities that could have led to something wonderful. Now, all this to say I don’t regret any of it. I don’t regret the places I’ve been, the people I have met, the mistakes I’ve made, and the ways Christ has pulled me out of the mire that I put myself in. What it is to say is the Lord has whispered the second option in my life, “The courage to stick around for something that is worth it.” The courage to stay in communion with Jesus and sit quietly with what the Holy Spirit whispers to me. To be complacent for once, and not have to be constantly moving to reach the outlandish goals I set for myself. I have always wondered what it would be like to find someplace that I could sit and be still. I even made a comment in front of some of the Fellow’s Committee members saying, “I don’t think the Fellows is busy enough. I feel like I have too much free time.” Side note, I may be the only person in fellows history to have made this comment, still waiting on my fact checker to get back to me on that one. I digress, my life has been this perpetual movement, this nonstop journey from place to place, thing to thing, meeting to meeting, and I have refused to stop. I kept running from what the Lord was teaching me in the suffering. Sprinting from what was right in front of me. The wisdom to sit in things that were worth sticking around for was very apparently lacking in my life. But hey, isn’t that what God is there for? So we do not lose heart. Though our outer-self is wasting away, our inner-self is being renewed day by day. For this light momentary affliction is preparing for us an eternal weight of glory beyond all comparison, as we look not to the things that are seen but to the things that are unseen. For the things that are seen are transient, but the things that are unseen are eternal. Paul captures, through the wisdom of the Holy Spirit, this idea of considering suffering but also realizing that the glory revealed to us in that suffering is worth sticking around for. Sticking around when you’re wronged because that person, place, or thing is worth more to you than a mistake. Sticking around for when you make a mistake and embracing the hurt that is caused because of it. Sticking around for giving up on an opportunity that could be better to sit where you are because what you have now is worth it. Discerning and having the wisdom to realize that the grass isn’t greener on the other side, and chasing waterfalls can lead to jagged rocks. The Lord calls us to sit and be still and then walk. Not go, go, go, and then go some more. I ended my last blog with, “Until then, I will be listening, living, absorbing, and cherishing every sweet moment that I get to spend here.” That’s how I will end this one as well because God has begun to settle my heart to listen, live, absorb and most importantly cherish every sweet moment that I get to spend here, with God, friends, and a place that is worth sticking around for. 2 months into a 9 month program. 2nd blog post out of 9 blog posts. Wait I’m already sad, let’s go back to 1. Which is wacky because this time last month I was still trying to decide if I liked these people and this place. There is so much traffic, everything is 25 minutes away from everything, it was mid October and there was still no fall (I moved from florida to north carolina- i didn’t move up to have no fall again), and i still miss my friends back home. But hang on.. these people are funny. They’re always laughing. We do fun things like go to the fair at 11am on a Monday, randomly go to a WWE fight and sit in box seats and eat free wings and cupcakes, spend entirely too much money on coffee and food just to be together all the time. This month was a turning point in my outlook on the Fellows Program. Once apathetic and kind of into it but mostly not really emotionally present, now house hunting with the girls and sad about it already being the end of October. I’m here for this. These people are teaching me a lot about what being a human is — having grace and kindness and joy and discernment, cultivating thoughts about the world beyond what i see on instagram and facebook, having feelings and not denying those feelings, understanding why you feel and what to feel and what to hold onto emotionally and what to let go of, realizing that we are not going to be everything for everybody but that we do have the freedom and the opportunity to reach further into relationships even if that means making yourself uncomfortable. Everyone finds growth in where they are. And the growth that I’m finding here in Raleigh is something that I am so happy that I’m not missing out on. I’m so glad that my apathy towards coming to Raleigh didn't stop me from actually coming. And I pray that I would not get lost in pure socialization- as I tend to do- but that I would use this time to see God and get to know His person and character in ways I’ve never known- through these people who I now love. Hey Raleigh, I’m here for this. I’ve been in Raleigh for approximately 53 days and I have already had my eyes peeled on the tiny homes with twinkly lights in sweet little neighborhoods. I’ll drive to destinations and point my fingers to porches that feel like they could be my own next year. I envision what it will be like to have a yard for bonfires and porches that facilitate conversation. It’s like I am slightly trying to fulfill this dream of being Joanna Gaines and HGTV needs to hire me for Fixer Upper, even though I have no architectural qualifications. There are so many clichés around homes. We like to exclaim that “home is where the heart is” and geek out around the concept of a “house becoming a home.” But aside from the aesthetic appeal of marble countertops, big comfy reclining chairs and king beds- we all have this innate desire to create spaces that feel like home. It’s not the foundation of the four walls that draw us close, but the safety fostered within. The blueprint extends beyond logistics and into pillars that protect us, shelter us and invite us in. I’m sure we all have different connotations of home. Some of us grew up in cold spaces where families were divided and love was withheld. Others of us grew up in kitchens where we danced and sung and felt freedom. Maybe the rest of us land somewhere in the middle. But I can’t get over the fact that home might not be solely in geographical locations. Maybe a home isn’t just an address we plug into Google Maps, but found in community and people. It’s the people who have the ability to unmask your theatric side that yearns to perform and allows you to walk into doors of authenticity. Homes are areas where our identities are formed and our belonging is reinforced. These homes aren’t created and bought in one day. We have realtors that help us weed out the unsturdy foundations and deconstruct the lies. We have days and months of building that involve time and patience. We have inspectors that check for mold and other harmful factors lying beneath our surfaces. We have interior designers that create warmth and fill in the emptiness. We have family and friends that make the space unique, lived in, and our own. Always find the pathway to your door. May there be a great delight around this hearth. What if we invited people into our homes and life? What if we welcomed and dwelled and loved without pretense? What if our doors were never locked? What if we tossed our masks at the doorstep? What if our lives became windows that were open and honest and our faith became brick that was sturdy and True? The first two months of fellows, a perspective (in one second snippets) by Laura Merten. This past week, aka yesterday during the 8:30am service, I heard a sermon in which the pastor touched on ways marketing relates to our walks with Jesus. He said that there’s a marketing technique used called FUD: fear, uncertainty, and doubt. Truly I don’t really remember what he said afterwards, but I know that those three words sums up how I feel going in to this year. My biggest hope for this year is that those words shift to something different. I’ve realized that I have all of this “stuff” to unpack and uncover from college. I thought I was going into this year completely free of any burden or weight. But the reality is, my experiences in college have shaped me in a lot of different ways, many good and many not so good . It took me all four years of college to unpack my experiences from high school. During my time in college, I figured out more of who I was and where the LORD was in the midst of my high school season. I am afraid unpacking college to some degree because unpacking can painful and hard. I mean some of us, myself included, hate unpacking so much we would hire people to do it for us if we could (which we can do but apparently it’s irresponsible to pay someone to unpack your belongings..idk) However, it’s the only way to make a house a home, so I’m ready to be like Chip and Joana, unpack, and decorate the house I’m living in this season. Speaking of the house i’m living in, HUGE shoutout to the Whited’s by the way for their graciousness and hospitality. This next year is going to be a year of growth, but also a year of healing, as I reflect on my time in college. To conclude, I told the Fellows a story which I think was very formative to who I am today. About a month ago, I was frustrated at a lot of things, I won’t go in to detail because this blog post will never end lol, and I was angry at the LORD. It felt like He had abandoned me and wasn’t hearing me. One day, as I was on my way to work, my car ran out of gas at a left turn at an intersection with the nearest gas station being about 0.25 miles away. Embarrassingly, I got out of my car and started pushing this heavy car on a protected left turn. I was fuming, furious at God because He was truly the only person I could blame for my idiocy. Just then, magically, the car got lighter and I thought that the LORD put some gas in my car… but then I shortly realized two Mormon men had gotten off their bikes and were pushing my car with me. I tell that story for two reasons. First, the LORD is faithful and He will show up regardless of how I feel about Him. Because that is just who He is. If that’s not the Gospel, I don’t what is *weeps. Just like how He showed up when I needed him to, I am positive that the LORD will show up this year as well, and I am excited to meet Him where He’s at this time. Second, the LORD showed up in the form of two Mormons helping me push this heavy car. Community is something I dread yet I know that God can and will do amazing things through other people. I’m nervous but also excited to go into this year with ten other guys and girls trying to figure out adulthood. We can be each other’s car pushing Mormons as we learn to love one another deeper, in turn learn to love others and most importantly learn to love God deeper. Join me on the next episode! Tune in a month haha!